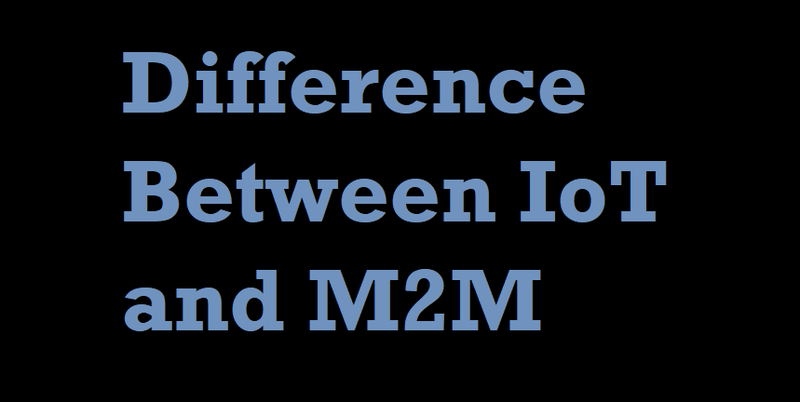 M2M and IoT can differ in how the communication between the machines or devices happens. M2M uses either proprietary or non-IP based communication protocols for communication within the M2M area networks. Commonly uses m2m protocols include Zigbee, bluetooth, Modbus, M-Bus, wireless M-bus, Power line communication, 6lowpan, IEEE 802.15.4, Z-wave etc. The focus of communication in M2M is usually on the protocols below the network layer. The focus of communication in IoT is usually on the protocols above above the network layer such as HTTP, COAP, Websockets, MQTT, XMPP, DDS, AMQP etc. The things in IoT refers to physical objects that have unique identifiers and can sense and communicate with their external environment (and user applications) or their internal physical States. The unique identifier for the things in IoT are the IP addresses (or Mac addresses). Things have software components for accessing, processing and storing sensor information, or controlling actuators connected. IoT systems can have heterogeneous thing ( e.g., home automation IoT system can include IoT system can include IoT devices of various types such as fire alarms, door alarms, lighting control devices etc) M2M systems, in contrast to IoT, typically have have homogeneous machine type within a and M2M area network. While the emphasis of M2M is more on hardware with embedded modules, the emphasis of IoT is more on software. IoT devices run specialized software for sensor data collection, data analysis and interfacing with the cloud through IP based communication. M2M data is collected in point Solutions and often in on-premises storage infrastructure. In context to M2M, the data in IoT is collected in the cloud (can be public, private or hybrid cloud). The various IoT Levels, and IoT components deployed in the cloud. The analytics component analyzes the data and stores the results in the cloud database. The IoT data and analysis results are visualized with the cloud based applications. The centralized controller is aware of the status of all the end nodes and sends control commands to the nodes. Observer nodes can process information and use it for various applications, however, observer nodes do not perform any control functions. M2M data is collected in point Solutions and can be accessed by on-premises application such as diagnosis applications, service management applications and on-premises enterprise applications. IoT data is collected in the cloud and can be accessed by cloud applications such as analytics applications, enterprise applications, remote diagnosis and management applications etc. Since the scale of data collected in IoT is so massive, cloud based real time and batch data analysis frameworks are used for data analysis. Communication in IoT is IP based networks. Communication within M2M area network is based on protocols below the network layer whereas IoT is based on protocols above the network layer. Redis : What and Why?